As a mom of 4 children, life can get pretty crazy. I can go from “happy mom” to “angry mom” very quickly. Stresses of being pulled in a thousand different directions at once can drain my energy and dampen my mood for prolonged periods of time. It’s reality, right? No matter what you do in your day-to-day life, there is always stress, and there is always a time when having something on hand to give you mood boost would be very helpful. 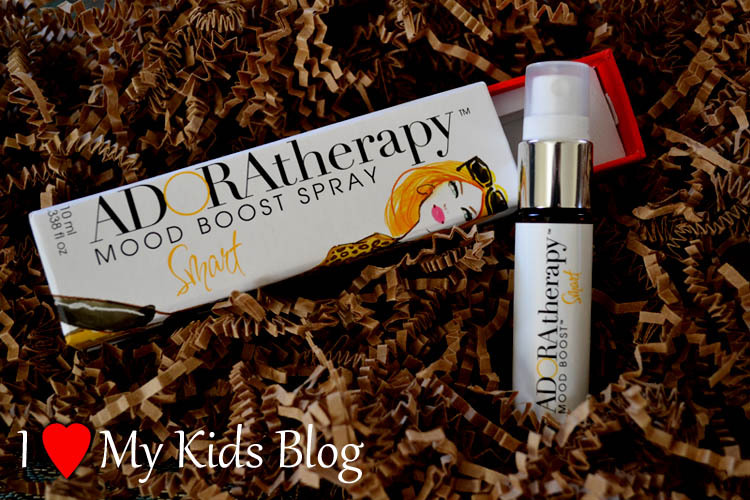 Adoratherapy Mood Boost essential oil Aromatherapy Sprays are your ticket to a shift in your mood on the go, with just a few spritz. 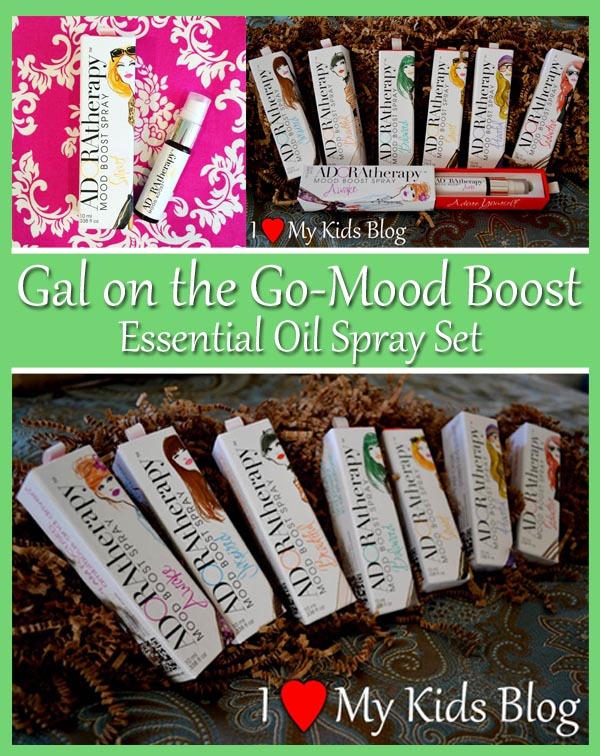 I have been using the Gal on the Go Mood Boost Spray Set for a week now. The set includes seven different essential oil blends that are designed to help boost your mood and/or set the tone for your day. The blends are Awake, Balanced, Beautiful, Inspired, Peaceful, Seductive, and Smart. You can buy them individually or as a set. When I first received the set I wasn’t sure how I would carry them all around with me, but then I realized that I only really needed to have two or three on hand at a time, depending on the activity I was doing. They easily fit into the pocket of my diaper bag, and the small case has a ribbon pull-tab that allows quick access when needed. 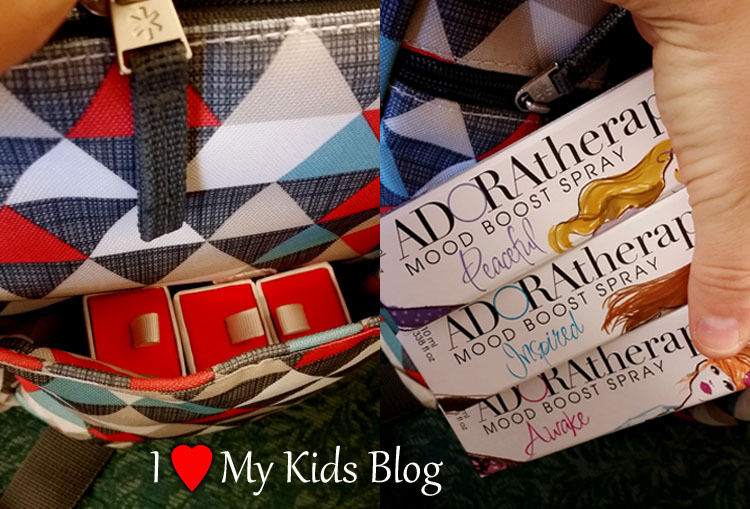 Knowing what moods I generally feel when I go to church, I loaded my bag with three of the Gal on the Go Mood Boost sprays. I had with me Peaceful, Inspired, and Awake. These were the three moods I knew I wanted to feel at church, but I also knew I was going to need an extra boost to feel them. Before leaving, I applied Inspire and away we went. My son, who is 7, struggles a lot with his behavior and has sensory delays. Times with him can get very stressful, very quickly. We were at church and he was having a very difficult time sitting still and being quiet, so I grabbed my diaper bag and we went on a walk. I took out the Peaceful mood boost spray and put a few spritz of the blend on his body. I put some on his wrist and encouraged him to take a few deep breathes through his nose and I put some on his shirt, knowing the aroma of the blends would radiate into his system. It certainly wasn’t an instant fix for him, but about 30 minutes later, he began to mellow out and had a great church going experience, which in turn, helped me as well. A little later, my 6 month old baby was fighting a nap. She was getting fussy and just couldn’t seem to get comfortable enough to relax. Knowing I had the mood boost sprays with me, I grabbed Peaceful and spritzed it on her blanket. I wrapped her up and rocked her. She quickly calmed down and was able to take a short nap. 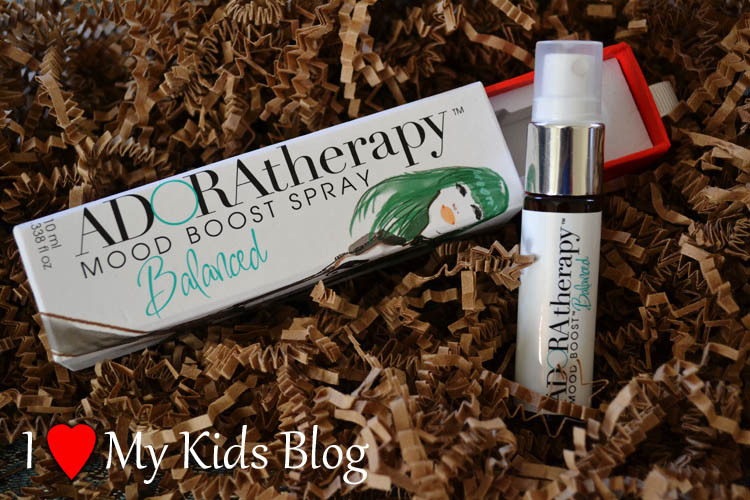 Through the week, I have used every mood boost spray and have had a positive experience with them. When I pick up a bottle and apply it, I focus on breathing in the aroma and usually say in my mind the name of the spray I am using repeatedly…that may seem silly to you, but for me, it helps get my thoughts in the right direction and is almost like a mental cleansing. One of the things I love about these products is that they are made with 100% natural and organic ingredients. I know that they are safe, not only for me, but also for my children. The benefits of using clean and pure products allow me to have peace of mind and confidence when using and referring them to others. I do not know a lot about essential oil blends, but have used aromatherapy products in the past. The main thing that I feel sets these products apart from the other companies out there is the fact that the products are pre-blended and you can purchase any particular essential oil blend you may be searching for at a comparable price to other companies. Adoratherapy has so many different products and blends available, so you can mix and match them to your needs, or purchase the sets for easier access. To learn more about essential oils and uses for them, click here. One thing I would like to see different in the Gal on the Go Mood Boost Spray Set would be to add a cute carrying clutch for easy, non-bulky travel. With seven different sprays, it isn’t feasible to carry all of them at the same time, due to their bulk. By adding a small clutch to the set, it would allow for easy portability and a true “on the go” experience. I look forward to continuing my use of these products and having a mood boost with me all the time. I know it will be great for use in my home, car, and work environments. Not only for me, but also for my children, husband, and others I meet. You never know, if I see you stressing out, I might grab one of the many options I have and spritz you. Don’t say you weren’t warned! Do you use essential oils in your daily life? If so, what do you like most about them? 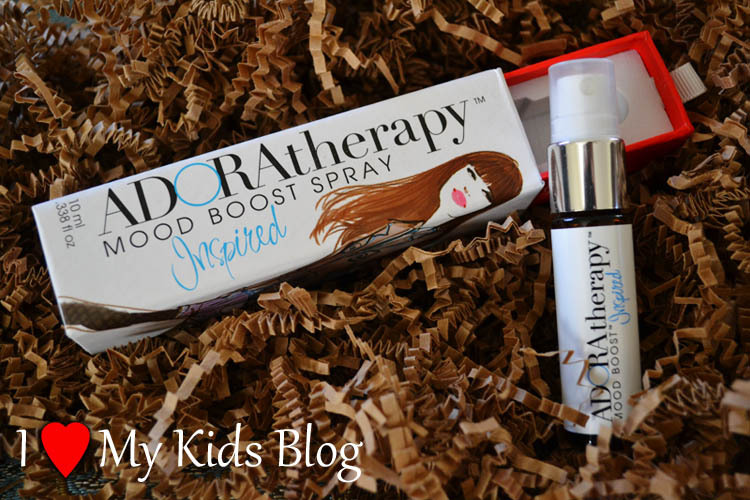 What intrigues you about the Adoratherapy Gal on the Go Mood Boost Sprays?